McCormick beats third-quarter expectations and looks for growth through acquisitions. NEW YORK ( TheStreet) -- McCormick ( MKC - Get Report) beat third-quarter expectations and reiterated plans to grow through acquisitions. The Sparks, Md., spice maker said Wednesday it earned $92 million, or 69 cents a share, down 10.2% from year-earlier profit of $102.4 million, or 76 cents. Despite the decline, results topped analysts' consensus call for earnings of 64 cents a share. McCormick's third-quarter revenue jumped 16% to $920.4 million, also higher than expected, as higher prices paid by consumers helped pad the company's top line. The company maintained its 2011 profit outlook for earnings between $2.74 and $2.79 a share. 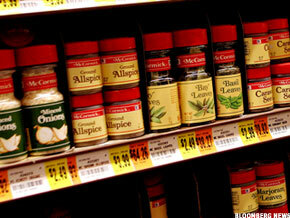 McCormick CEO Alan D. Wilson said the company's key growth strategy is to expand through acquisitions. The maker of spices, herbs and seasonings recently completed the acquisition of Polish spice maker Kamis, as well as a joint venture to market Kohinoor, a brand of basmati rice and other food products, in India. In the U.S., McCormick acquired Kitchen Basics, a maker of liquid stocks used for cooking, in a $38 million deal. McCormick shares were unchanged in premarket trading Wednesday after closing higher at $47.69 in Tuesday's session. >To follow the writer on Twitter, go to @miriamsmarket.